01182013_Becherer_Pakistan024: Global News Events: Global News Portfolio: New Orleans based Photojournalist covering the Deep South and beyond. LAHORE, PAKSITAN. 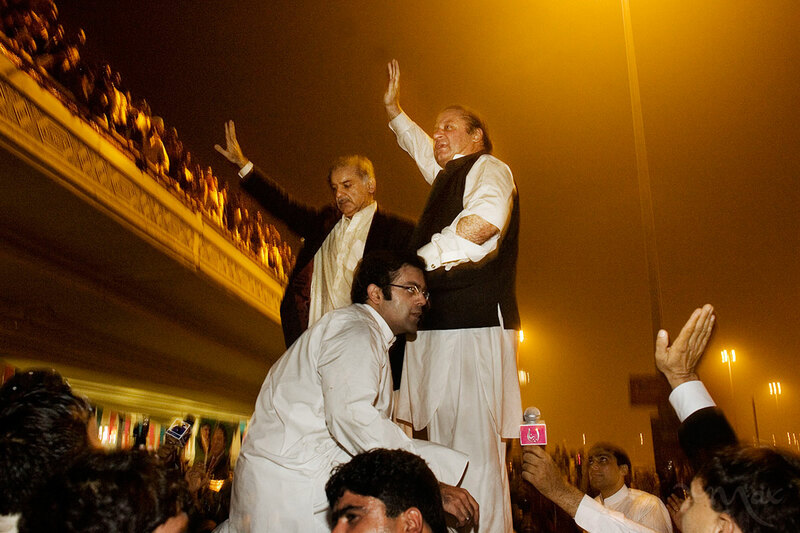 Former Prime Minister Nawaz Sharif, right, and his brother Shahbaz Sharif, left, stand on the top of a vehicle as they wave to hundreds of supporters after arriving at the Lahore Airport from Saudi Arabia on Sunday, November 25, 2007 in Lahore, Pakistan. President Pervez Musharrif sent Sharif and his brother into exile some eight years ago. He has arrived in Pakistan to head one of the country's leading opposition parties.